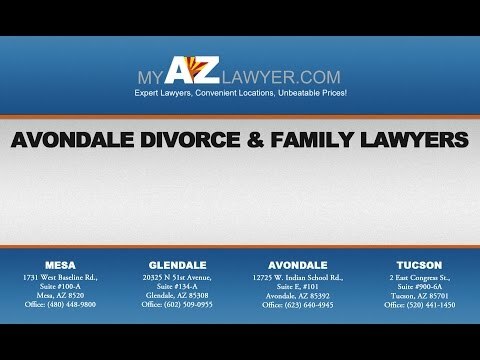 An experienced Avondale family law attorney can help you with the dissolution of marriage, or divorce, in Arizona. My AZ Lawyers will represent you and see you through what could be an emotional and stressful time in order to get you the best outcome for you and your family for your case. There is a time limitation in Arizona for a divorce: the Court cannot grant a divorce for 60 days after serving the divorce petition. In fact, on an average in Maricopa County, Arizona, a divorce takes 8-10 months. If it is contested, it requires a trial. My AZ Lawyers can provide the most cost effective and timely process in order to reduce the time from start to finish for your case. Filing for divorce is a situation that is pressure filled. Thus, if you are facing a divorce, hiring an experienced family attorney is best. Additionally, with an attorney on board, guidance through the hard times is certain. Thus, to begin the divorce process in Arizona, one must file a Petition for Dissolution and serve those documents upon the other party. While the person served has 20 days to file a response to the petition (30 days if he/she lives out of state). Then, after 60 days, the Court can enter a decree if the parties have agreed on all terms of the dissolution and if they have submitted the appropriate documents. Also, the Court will set a Resolution Management Conference if a settlement is not reached to help both parties agree on a settlement, but if that is not successful, a trial date may be set. Just know, our Avondale family law attorneys will be with you every step of the way. My AZ Lawyers offers its clients support, assistance, and expert representation. The experienced family law attorneys will fight for your rights. Additionally, we will always pursue options and proceed with your best interests in mind. Whether we help with documentation, or whether we have to prepare to defend you in court, My AZ Lawyers provides an aggressive pursuit of your desired outcomes in your case. Plus, our Avondale family law attorneys care about their clients and work diligently to represent their needs. Find our Family Law Firm office located in the Palm Desert Plaza Professional Center, Avondale, Arizona.